It's not secret that the average Labrador Retriever pup like to chew...everything in site. It doesn't matter what it is, a Lab will find it and chew it. Labs are easily bored and also very inquisitive and they love to chew anything they can get their paws on. Fortunately a Labrador Retriever pup can be taught to moderate his chewing behaviour and only chew on those objects he is actually allowed to chew. But that is probably easier said than done. Never-the-less there are things you can do to teach a Labrador Retriever pup what not to chew. In this article expert vets from Drs Foster and Smith discuss dogs chewing behaviour and how owners can address the problem. One of the ways that dogs learn and explore is through the mouth It's another way to learn about their surroundings. To stop dog chewing behavior an owner needs to redirect the behavior toward acceptable items. Puppy proof a room: Remove all objects that are chewing temptations for the puppy. Be sure not to have any items that resemble those that you do not want chewed such as shoes and plants. Important: Remove all dangers such as an electrical cord. Use a Crate or Puppy Proof Area When Away: Don't give a pup free reign of the home. Keep them in the area that is safe and that limits chewable items when out of the house. 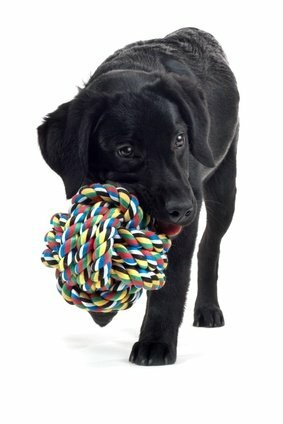 Buy Dog Chew Toys: By focusing the pup on familiar chew toys, the puppy leans which items are acceptable for chewing. Supervise the Puppy: When the pup is out of the secure area or crate, supervise the behavior. Provide your puppy with a chew toy. Good choices are the Nylabone Puppy Chew Kit and Gumabone. Puppy teething toys such as a Kong Teething Stick will also keep a pup busy for long stretches of time. 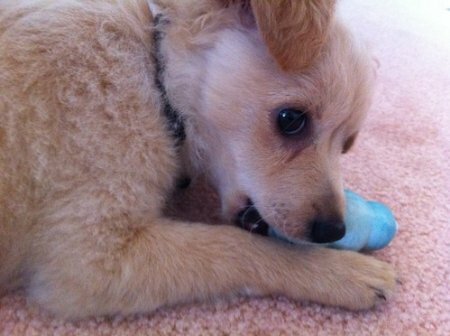 A puppy teething toy will stimulate the gums and redirect a pups chewing behavior. Make Leaving the House Routine: Do not make a big deal about leaving the house. One tip is to rub one of the chewing toys between your hands about 15 minutes before leaving the house. This will keep you familiar scent within reach of the puppy. Give your puppy a new toy or one that is kept out of site right before you leave to distract the pup. Do not acknowledge any whining or barking in order to incorrectly associate that behavior as attention getting. Making leaving stressful can result in separation anxiety. Exercise and Play: An active dog is a happy dog. The best way to keep a puppy from getting bored is play and exercise. If they are given other ways to consume energy, they are less likely to spend whatever energy they have left chewing. Popular forms of exercise are walking, running, or even swimming. Corrective Behavior: Correct your dog any time he or she picks up something she shouldn't. Replace the item with a chew toy. Provide praise and affection when the pup starts to chew the toy as a positive reinforcement. If a dog continues to chew on items that are not appropriate, then spray that item with Grannick's Bitter Apple Spray, which makes the taste to the item unpleasant to the pup. A Pup chewing toy like this one from Kong has a compartment for hiding a dog treat. A pup will spend hours trying to figure out how to get the treat. The toy provides mental stimulation while satisfying natural teething behavior. Train Your Pup: Teaching can take place at any time. Try putting acceptable chew items next to unacceptable items on the floor. Pretend to ignore the pup. If she puts her mouth on one of the unacceptable items, say a clear "no" and point to the bone. Gradually the puppy will learn that when you are in the room, she can only chew the toy or bone. Next, leave the room for a short time. Go back into the room right way to catch the puppy chewing something unacceptable. Say no and point to the bone. Once she takes that toy provide praise. If the puppy continues to chew items that she shouldn't when you are away, then leave the pup in a crate with the acceptable dog toys when out of the home. Another tip is to have a basket in the home that holds the toys. Eventually the puppy should learn to only chew on the correct objects.